Children as well as adults go gaga over star wars series. In addition, it is pure bliss when star war snowflakes are in the house party. The birthday parties of your kids or a group of teenagers preparing a farewell party you can always count star wars as theme for decorations. The templates are just like Christmas snowflake templates. This Star Wars snowflakes DIY is a beautiful pattern of snow flake that can be used for decorating your home for any occasion to impress those friends and relatives who are Star Wars fans quite like you are. Have a look this awesome Star Wars snowflakes patterns that has the beautiful Rancour effect. You can go for some other paper colour in place of trying all-white or you may even mix and match different colours together. Are you looking for a beautiful snowflake design that looks quite different from the regular snowflakes? Have a look at how the Star Wars character Leia is represented in this Star Wars snowflakes YouTube. This is an amazing Anthony Herrera designs for Star Wars snowflakes. You may try creating this snowflake design at your home with just a plain sheet of paper. Just follow the technique closely and you will be able to create matchless snowflake design. Have you ever thought the the Star Wars interceptors would be reflected in the snowflakes? Just see how nicely and minutely this snowflake has been crafted. But since it is very fragile, it would be better if you print it on a coarse and tough paper. 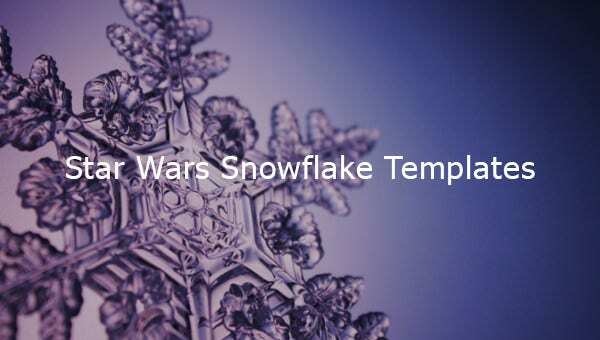 This is an elegant snowflake that has been created on the basis of Tusken Raider of the very popular Star Wars series. Have a look at this creative snowflake template and it’s sure to appear impressive to you. Remember Han Solo of the Star Wars series. If you were a die-hard fan of him, then this Star Wars snowflakes 2013 would definitely mesmerise you. By decorating your home with this pattern for Christmas is sure to impress your guests. Lastly, this Star Wars snowflake patterns has a beautiful design and as it is available in a PDF format, you can easily download and print it out and join it with strings to adorn the garden area, walkways and other areas of the exterior landscape. Quickly download these adorable cool star wars themed snowflake templates at free of cost. They are available in friendly formats like word, excel and PDF. So what are you waiting for? Just unleash your Jedi creativity using these templates and plan decorations.